In this Rio Review we look at how one year ago Zhang Jike shot to social media fame. But how many followers does he have now? Table tennis players like to hit the practice hall. They also like to hit the gym. But most of all, Zhang Jike likes to hit the snooze button. The Rio Olympics will be remembered as the Games where Zhang Jike rose to social media fame back home in China. In the quarterfinal of the Men’s Singles, Zhang dropped the opening game to Japan’s Koki Niwa. He was looking a little drowsy, and no wonder, he had been napping just moment’s before the match. Inside sources leaked this image of the table tennis start preparing for his upcoming game. Coach Liu knew Niwa was too good for his player to simply sleepwalk to victory. So with words like a bucket of cold water, Liu provided the tactics needed to awake the sleeping giant. 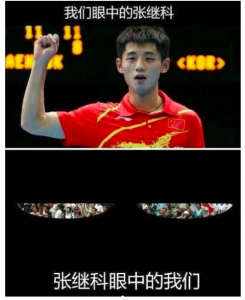 Zhang wiped the sleep from his eyes and took the match. Despite the win, Chinese social media had a field day with Liu’s tactic. By the time the dust had settled from the Game, Zhang had not only picked up two medals in Rio, he’d also won an extra 2 million followers on his Weibo account. Zhang Jike now is one of the most popular athletes in China, with a fan club to rival any rockstar’s. It won’t come as a surprise to discover that the Grand Slam Champion’s social media standing has been on the rise ever since. One year on from the games and he now has 8.5 million followers; every one of whom wants their star to stay sleepy.